A trip to Australia or New Zealand would not be complete without sampling the national dish, the pie. In new Zealand a detour to the little town of (need to remember the name!) is the best place to enjoy the incredibly tasty pastries. 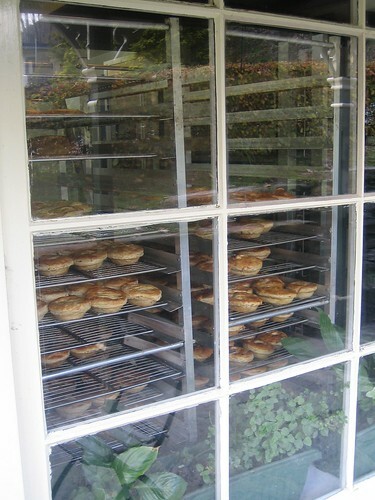 In Australia, (I can’t remember what the bakery was called but I remember many visits) a drunken night out would not have been complete without a visit to the 23 hour pie shop in Byron Bay. It was on the main street and as with most pie shops in Australia and New Zealand the array of different pies available was incredible, from spaghetti bolognese to steak egg and cheese. The best pies in Byron are Byron Gourmet pies. Go to their factory on the industial estate and pick them up straight from the oven for just over $3. Yummy! NZ pies are the best-Ive travelled all over the world and love searching for and eating pies. USA-all sweet fruity and sickly – no real meat pies -except for 2 I found with NZ and Aus links-one in Brooklyn and the other in Portland-otherwise not to my taste. UK- pretty damn good-esp some of the stout and beef pies. Some a bit stodgy and without the variety and freshness that NZ ‘pois’ seem to have. Scottish pies are very interesting with a unique pastry and some interesting types-try a haggis pie! AUS- next best to NZ also with some nice flavours and combos! Jaffle pies in WA (I think that this is a NZ coy??) have some nice types and are a bit different. CHINA – have come across some nice and spicy types – flatter more like a pastie with thin crispy pastry and also some wrapped in a bread crust. Still cant beat a good old Kiwi Steak and Kidney ‘poi’ though!! !